So beautiful! It’s exactly as described. 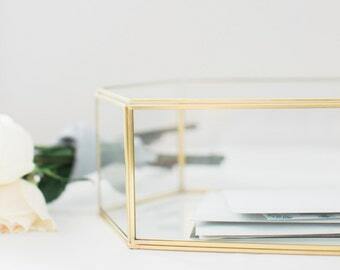 I can’t wait to use this card box at my wedding! 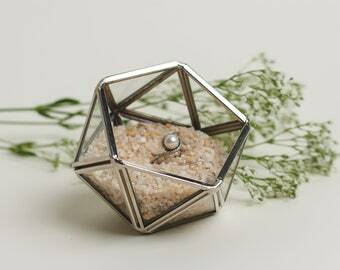 Our gem card box is available in silver! And also check out our improved shipping rates! 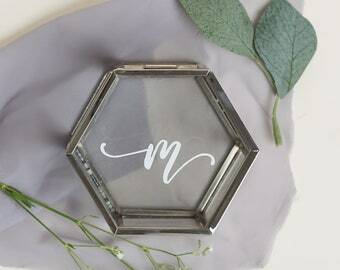 One of our best sellers, personalized hexagon ring box is a perfect choice for a gift for your someone special! 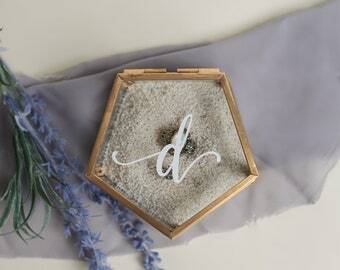 Dusty grey chiffon table runner and geometric gold - to die for! Romantic, soft, modern, and elegant. It's possible to have it all at once. The day I made the most important decision of my life - "Yoorim and Jeremy Forever"
It all started with our engagement. Jeremy and I have been planning our together-forever-life together the past 10 months. 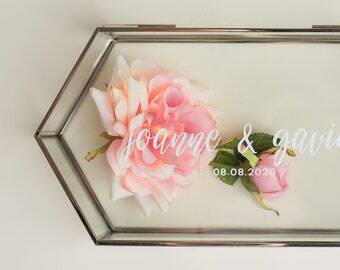 As a bride-to-be, I know some of you can empathize, I wanted the wedding that is timeless, elegant and modern. 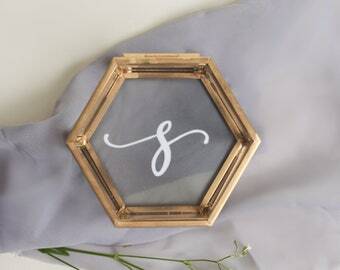 Hours and hours were spent on pinterest, wondering directionlessly to find THE THEME of our wedding. I was really lost! Then I came about geometric terrariums. But I never quite found the perfect finish. 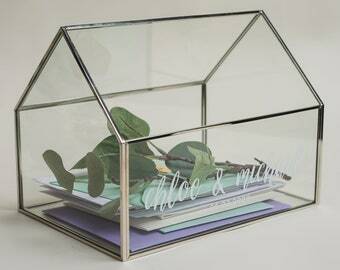 There are many beautiful geometric terrariums out there but not quite perfect for the wedding of my dreams. That's when my coworker inceptioned me (is that even a word?) "Why don't you just make it?". Why, yes! I am a mechanical engineer, I can totally figure this out. So I did. It wasn't easy. Many prototypes, many failures, many glass cuts and minor injuries after, Euris is finally here. Euris designs and crafts products with you in mind, to take care of my brides-to-be, avid home-decorators, planters, lover of pretty things! We love to collaborate with customers and bring ideas to life. 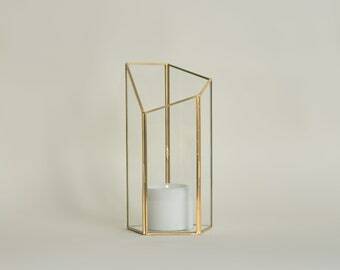 Please add description of what you'd like and dimensions of the products. We can help you fine tune the products to perfection just for you. Most of Euris products can be transformed into a larger size. However when they are too large, they lose the structural integrity and may be too risky for shipping across the world. If you request a very large piece, we may ask you to find a local supplier who can meet your needs without the risk of damaged products. Please don't feel shy to reach out and let us know what you'd like and we can figure it out from there! We double box every order. The inner box and outer box is filled with void filling products to ensure your order gets to you in one piece. Although we double box all our products, we can not control the handling process during delivery. If your product has shown up damaged, please take a photo of the damaged goods within 24 hours of delivery and contact us right away. We will replace your damaged products as soon as we can. Yes. We understand that you may need to receive your order by a certain date and our current production lead time may be too long. You can purchase "Skip the Line" along with your item when you check out. When you purchase the "Skip the Line", the production lead time shortens to 3-4 business days. We have some of our products available at Greater Goods YYC in Calgary. If you'd like to see the product before you purchase and happen to be in Calgary, head over to Greater Goods and see it in person! If you are local in Calgary and would like to avoid majority of shipping fee and pick up your order, we can definitely arrange that for you. Please drop us a line and we can share the coupon code which can be applied when you check out! Is there an Express Shipping option?